Steve McQueen’s already celebrated picture consciously manages to find a medium ground between the intimate and avant-garde roots of his earlier pics and the broad historical canvas of American slavery. As devastating it is to see slavery depicted on screen he never seems to match the level of visceral impact as his debut Hunger. Thus, however powerful and moving there’s a feeling he’s tamed himself for the sake of American and Hollywood acceptability. I couldn’t imagine the process of creating a story like this, especially carrying the burden of loaded history and with such a broad canvas to cover. Working from Solomon Northup’s actual book with writer John Ridley McQueen’s narrative sensibilities shine through. Despite the broadness of subject matter, the film is organized with the same kind of episodic intimacy of Hunger or Shame. There are no montage scenes to bridge time, few sweeping wide shots in the classic Hollywood sense, at times a self-constrained epic fearful of dream factory methods which could tarnish the auteur-leanings of its creator. If anything 12 Years a Slave is to slavery as The Master was to Scientology. A film primarily about a subject, but told through character, in a collection of scenes without traditional narrative structure. 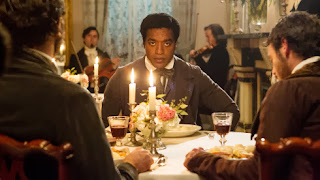 Solomon Northup’s entry into the institution of slavery is a brilliant sequence. We first see him as a New York northerner, a free man, living as a classical violin player in the circle of New York’s elite. The sight of well-dressed Northup walking through the streets with confidence and pride past a slave from the south next to his master sets up his tremendous downfall and journey towards freedom. The devilish scheme perpetrated against him by a pair of travelling circus owners (played with aplomb by Scoot McNairy and Taran Killam) is a frightening con. After being drugged he wakes up in the middle of nowhere in chains, kidnapped and soon to be sold off. We don’t know or see exactly what happened, or even if the circus owners had anything to do with it. We assume so, but McQueen purposefully does not connect the dots. Northup is moved through a number of hands, and owners of the course of twelve years. His purchase is equated to that of livestock, displayed like commodities by a quickie appearance by Paul Giamatti (who seems to fit the bowler and plus-fours so well). Every step of the way he encounters shamefully inhumane treatment. Some good folk along the way including Benedict Cumberbatch are unable to help Northup, who is encouraged not to tell anyone he can read or write, let alone a free man from the north. As articulated dramatically by Homeland’s Chris Chaulk, to survive one must speak as little as possible. Clearly there would be no movie if Northup adhered to this advice. It’s moments like this where the rousing narrative leanings of Steven Spielberg or Clint Eastwood threatens to rear its head. McQueen and Ridley pepper the film with lines like ‘I don’t want to survive, I want to live’, but for the most part they consciously avoid turning this into sanctimonious drama like Amistad. McQueen’s supplants our expectations early when we see Northup triumphantly fight back against the vile tongue lashing of Paul Dano. This is a scene we’d likely see in the third act in any other film, but Northup’s whipping of Dano’s character shows us both Northup’s instinct to stand up to himself as well the range of acceptable behaviour on the slave owner side. What remains thematically consistent is the economical implications of slavery, slaves are property and property is money. Michael Fassbender’s character, Northup’s last and most sadistic slave-owner, even avoid type as a man harbouring deep personality disorder causing some strange passive aggressive behaviour with Northup. His wife (Sarah Paulson) turns out to be most consistently brutal person in the film, fueled by inferiority and jealousy with her husband’s coziness with the female slave Patsey. But we’re never spared the startling heinous torture of both Northup and Patsey. McQueen’s technique moves farther away from the art house formalism of Hunger, into a conventional look and feel accessible to lay audiences. And yet we can still feel the hand of the director in a few lingering shots, in particular a remarkable close up of Ejiofor reacting to something we never see, scanning the frame, including breaking the fourth wall into the barrel of the lens. By consequence the visceral impact of his violent imagery is also farther removed from Hunger. Moments such as Northup hanging an inch from his life by a tree branch for hours as punishment for beating Dano is no doubt startling. Same with the bloody whipping of Patsey by the forced hand of Northup. These moments are powerful, but nothing as visceral as the prison guards’ beatings of the prisoners in Hunger, or in comparison to another slavery drama, the opening sequence of Amistad. And so, with 12 Years a Slave, despite its resounding acclaim, viewers should be prepared to be confounded as much as emotionally impacted.